Have you got your tickets yet to see hit touring show Mrs Brown’s Boys D’Musical? at Nottingham Motorpoint Arena from April 19 to 21 and Sheffield FlyDSA Arena from December 6 to 8? Starring Brendan O’Carroll and your favourite stars from the hugely popular TV series, Mrs. Brown’s Boys D’Musical? promises to take audiences on an exhilarating, side splitting and musical adventure. 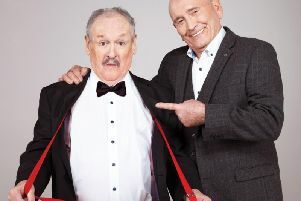 Brendan O’Carroll said: “Mrs Brown’s Boys D’Musical? will have you crying with laughter, tapping your toes and you will leave the show singing and smiling to yourself. The success of Mrs. Brown’s Boys has been nothing short of incredible. Voted the No. 1 Sitcom of the 21st Century, awards include five BAFTAs, four National Television Awards, three TV Choice Awards, four IFTA awards, three TV Times Awards as well as RTS, TRIC and National Comedy Awards. For ticket availability, you can click here . You can also click here for more on another show coming to the area.